No other set of cans look as provocative as the Marshall Monitor. Between its premium materials, fantastic design, versatile functionality and solid performance, these headphones warrant serious consideration. How do you cram almost 50 years of rock-n-roll legacy into a pair of headphones? That’s the weight on the shoulders of Marshall’s Monitor headphones, the latest headphones from the company whose amplifiers backed rock stars such as AC/DC, Eric Clapton and Jimi Hendrix. 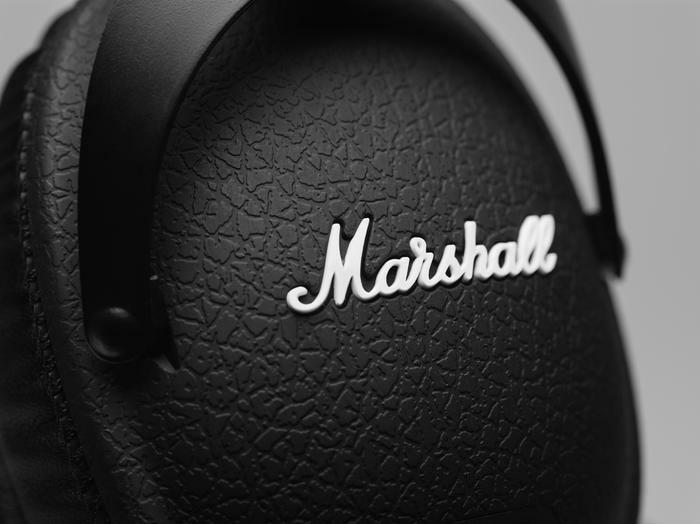 Design cues nodding to Marshall’s range of guitar amplifiers can be found everywhere on its Monitor headphones. Black is lavishly used on its cups, metallic arms and headband. Faux leather on the outside looks roughened, but any other part destined to touch the skin is smooth in texture and sumptuously dressed. Breaking the monotone monotony are brass accents. Plenty of attention has been paid to tiny details, such as the Phillips-head screws fixing the brass ‘left’ and ‘right’ nameplates. Wiring from the headband to the cups is coiled, similar to that of a guitar cord. The auxiliary cable too is coiled, and its 3.5mm plugs are coated in studded gold. Only one cable is included with the kit. It comes equipped with a simplistic mic-and-remote combo and can be plugged into brass-rimmed 3.5mm ports on either the right or left cups. Having two auxiliary ports makes it possible to plug a pair of headphones into the Monitors so that music can be shared from one source. The final design cue is white script found on each cup that reads “Marshall”. These materials have been bonded to a shape that is taut, balanced and practical. In its natural state, the Monitor’s tight headband causes the two circumaural (over-ear) cups to kiss. Braces this tight often lead to discomfort during long listening sessions. 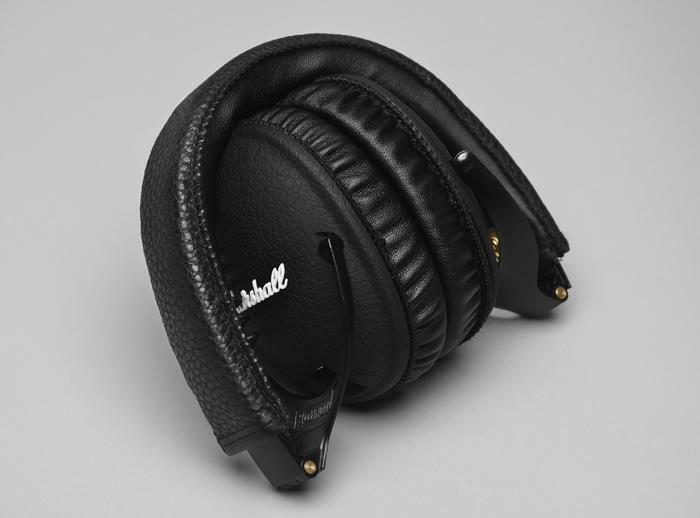 Marshall has padded its band with sumptuous leather in an effort to make the Monitors more comfortable. It works fine over short periods, but after jamming for a couple of hours, you’ll feel heavy headed. Bowers & Wilkins’ P7s are a little heavier, but Sennheiser’s Momentum have a lighter footprint. Hugging the scalp tightly is how the Monitors keep unwanted distractions out for a soundstage that is blank. Nor will passers-by be able to tell what songs make up your playlist; only a hint of sound bleeds when music is played at max volume. The leather cups comfortably envelop even large ears (guilty), and work well to create an spacious soundstage. Removing the magnetic cups reveals Marshall’s “F.T.F” sound system. The patent-pending system is meant to replicate the warm sound popularised by Marshall’s famous guitar amplifiers. It consists of fabric insets covering the Monitor’s custom 40mm drivers. Removing these insets adds more volume, clarity and bass to the benefit of some genres, while keeping them in softens the sound for the betterment of others. The ethos behind the F.T.F system is, at the end of the day, you get to decide the kind of sound you want from your headphones. Our testing found the insets are best taken out for electronic genres alone, such as House and Trance. Guns N’ Roses’ Sweet Child O’ Mine is played with the level of respect the rock melody deserves by serving up plenty of volume and offsetting it with dextrous balance. Generous space between the vocals, drums, symbols and the electric guitar imbues these headphones with dimension. The mid-range could do with more gusto, but overall the sound is as transparent — and not exaggerated — as the Monitor moniker promises. Holocene highlights how tactful these cans are when it comes to layering a tune and creating the sensation the music is being played from speakers positioned all around you. The Monitors are versed in all sorts of bass. The R&B anthem Dance with me by 112 was characterised by deep, oscillating bass. Sennheiser’s Momentum edges ahead on account of handling such tunes with more precision, but the Monitors compensate by reaching louder volumes. 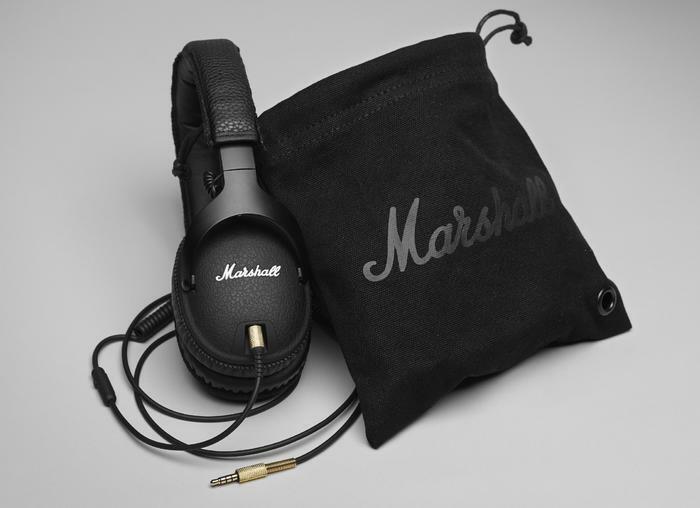 Even electronic tunes, such as Tether by CHVRCHES, are suited to Marshall’s Monitor headphones. The Monitors’ folding arms and pivoting cups makes them a convenient mobile companion. The only shame is the ‘phones must make do with a satchel instead of a solid case. 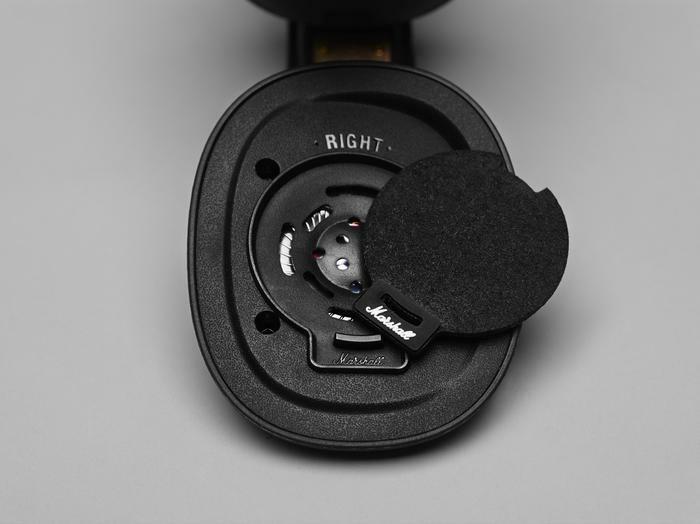 Marshall’s Monitor headphones are not without fault: they’re heavy and don’t come with a secondary cable or a sturdy carry case. But at $299, these over-the-ear headphones represent exceptional value. Sennheiser’s equivalent Momentums cost $100 more and, as wonderful as the Momentum heaphones are, they’re just not worth a 25 per cent premium.